Most believers are worldly and don't walk close to the Lord as we all should. There's nothing sweeter than drawing nigh to God and walking close to Him. Very few believers truly walk with God. We don't hear enough preaching and teaching on “How To Walk With God.” Do you know how to walk with God my friend? GET SAVED. In order to walk with God, you absolutely must be born-again. Romans 8:9, “But ye are not in the flesh, but in the Spirit, if so be that the Spirit of God dwell in you. Now if any man have not the Spirit of Christ, he is none of his.” If you are saved, then you have God's Holy Spirit (which is the Godhead) living inside (indwelling you). 1st Corinthians 2:14-16 teaches that the natural man (or the unregenerated, unsaved, man) cannot discern spiritual matters. You must come as an admitted sinner and believe the Gospel (good news) of Christ crucified to death on the cross for your sins, buried and bodily resurrected three days later to be saved. It's that simple. GET BUSY SERVING GOD. Matthew 11:29-30, “Take my yoke upon you, and learn of me; for I am meek and lowly in heart: and ye shall find rest unto your souls. For my yoke is easy, and my burden is light.” The way that we learn about Jesus, as you've just read, is to take His yoke upon you. A “yoke” is a device that is placed across the shoulders of two oxen so they can share the work load, the burden. Our churches are filled with believers who sit on their blessed assurance and never do anything for God. You'll never have a close walk with God unless you are busy doing something for God. Help the man of God, whether it be your pastor or the genuine evangelist. Don't support ecumenical apostates like Billy Graham (who gets paid over $600,000 a year to corrupt churches. What a disgusting sellout!). Support missionaries through your local church. Drive a bus for your church. Volunteer to help the local soul-winning church. Don't support a dead church with a lazy pastor. PRAY ABOUT EVERYTHING ALL THE TIME. Every Christian should pray and read the Holy Bible, but if you're idle for Christ, you're going to become discouraged quickly. Prayer is not a religious duty; but rather, it's God's way for the believer to communicate with Him, asking for God's help in all that we think, say and do (Philippians 4:6-7; 1st Thessalonians 5:17). When you don't pray, you are saying, “God, I can do it myself, I don't need your help.” Praying is letting God know, that we know, that we need His help in everything that we do. James 4:6 says God avoids THE PROUD, but gives grace to help THE HUMBLE (Hebrews 4:15-16). BE SOUL CONSCIOUS TO GET OTHERS SAVED. Most believers are not soul-conscious. They've never been properly mentored to obey The Great Commission (Matthew 28:19-20). They are not interested in the things of Jesus Christ. God didn't save us to BE GOOD, but to DO GOOD. What are you doing for God to get souls saved? All across America there are dead churches who couldn't care less about getting lost sinners saved. That's why they don't have a bus ministry. That's why there's no soul-winning program. Luke 8:15, “But that on the good ground are they, which in an honest and good heart, having heard the word, keep it, and bring forth fruit with patience.” The first part of The Great Commission in Matthew 28:19-20 is “GO YE!” In Romans 10:15 God calls the “feet” of the believer “beautiful,” because even the most eloquent words and greatest wisdom are completely WORTHLESS if someone's feet are too lazy or indifferent to carry the Gospel of the Lord Jesus Christ to the lost (2nd Corinthians 4:3-4). 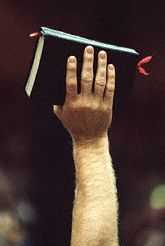 FIND A KING JAMES BIBLE ONLY, SOUL-WINNING, INDEPENDENT FUNDAMENTAL BAPTIST CHURCH. Most churches are occupied with bald-headed old men and grey-headed old women, but there are hardly any youth. Why would young people want to be a part of something that is DYING? Rock singers are energetic, run around on stage, holler, giving their all to the audience; whereas most pastors stand idle, mumble some religious words, and couldn't preach their way out of a wet paper bag! Church should be exciting! The pulpit should be alive! The pastor should be a firecracker in the pulpit! Young people want to be a part of something that is alive and growing! Real preaching is fire in the pulpit melting the ice in the pew!!!!!!! Bless God, if you can't find a good fundamental church near you... MOVE!!! We all need HARD-PREACHING. Children need hard-preaching! I wouldn't stay in a dead church that doesn't have preaching. I attended an Independent Baptist church (they certainly weren't fundamental) that didn't mention the word “Hell” once in 11 months. I respectfully tried to help the pastors by sharing hard-preaching with them by various Baptist preachers, but their hearts were hardened and they refused to budge. I got out of that mess!!! BE CONCERNED ABOUT LITTLE THINGS. This may seem like strange thing to say, but in the nearly 35 years that I've been a born-again Christian, I've learned that the hallmark character trait of a Christian that's right with God is a consuming passion over little things—a deep concern for truth, caring which Bible version we use, keeping our promises, paying our debts, meaning what we say, being careful about how we think and behave, and doing right by other people (loving thy neighbour as thyself). I can determine right away whether a professed Christian walks with God or not just by seeing how they treat other people. A greedy believer is distant from the Lord, because the Lord is generous. A believer that's hateful against people doesn't know Christ very well, because Jesus is full of unconditional love for all men (Romans 5:7; 1st John 3:16). Likewise, a believer who doesn't hate sin is not close to the Lord, because Jesus hates iniquity (Hebrews 1:9) and preaches against the world's sins (John 7:7). Walking with God means becoming like the Lord, because He rubs off on us. You can tell a lot about a man by the company that he keeps. If you pray to God and abide in His Holy Word, asking Him to show you what needs changing in your heart and life, and He will show you. Most people who attend church have never been saved, and most of those who are saved don't walk close to Jesus Christ. My website ministry was birthed in 2002 out of a passion for truth and a consuming fire in my soul to preach God's Word!!! Jeremiah 20:9, “Then I said, I will not make mention of him, nor speak any more in his name. But his word was in mine heart as a burning fire shut up in my bones, and I was weary with forbearing, and I could not stay.” Brother, if you walk with God, His inspired Words will rip your heart out! This earthly life is so very short. Whether you're age 20, 50 or 70, all you've got to look forward to for certain in this life is: taxes, hospital beds and graves. The great need of the hour is PREACHING PREACHERS! But we don't have many preachers today, because everybody is walking with internet blogs, New York Times Best-selling authors, religious radio shows, religious magazines, heretical apostates like John MacArthur and Ravi Zacharias, dead religious seminaries (cemeteries) and every form of distraction imaginable; when they ought to be wallowing in the Holy Bible. You'd be better off spending five minutes digesting the Word of God than spend all day listening to religious radio. Jesus told us to SEARCH THE SCRIPTURES (John 5:39). Walk with God, not men. I'm so sick of hearing pastors quote John MacArthur, Rick Warren, Ravi Zacharias, Billy Graham, Pat Robertson, Joel Osteen and other apostates!!! By the way, all these names I just mentioned are self-made millionaires, ill gotten by selling out for money. GET RIGHT WITH GOD!!! There's a big difference between a God-called preacher verses a man who decides to preach for profit. It'll be a cold day in Hell before I ever accept a penny for serving God. The reason why preachers won't preach is because they prioritize money over God. Too many people are selling out for a paycheck or a profit. The world is going to Hell. When's the last time that you heard an entire sermon on Hell, fire and eternal damnation? When's the last time you even heard a preacher mention Hell and everlasting fire? All we hear about from televangelists is the need for money. Most preachers have sold out for mammon, caring not for the things of Jesus Christ. Their damnation slumbereth not, they're already damned! Oh my friend, if you ever truly let God get a hold of your heart, you'll have a burning desire inside to live righteously, expose falsehoods, love all people, help the poor and needy, care about little things, pray about everything, thank God continually in everything, preach the Gospel and do all that you can do to please the Lord Jesus Christ, which is why we were created (Revelation 4:11). If you want to walk with God, then you must walk in truth and spirit (John 4:24). WALK WITH GOD!! !